Tá Gaelscoil Mhuscraí ag déanamh gach iarracht Teicneolaíocht an Eolais a fhorbairt sa scoil. Tá seomra ríomhaire againn, áit a bhfuil 25 ríomhairí ar fáil dona páistí chun obair ar thionscadail agus dul i dtaithí ar phacáistí bog-earraí. Tá ríomhaire glúine ag gach múinteoir agus tá teacht ar flip-cam, visualiser agus ceamara digiteach i ngach seomra ranga. Tá bórd bán Idirghníomhach ag sé sheomraí ranga agus tá úsáidtear teilgeoir digiteach ar fáil sa seomra eile. Tá leathanbhanda ar ghach ríomhaire atá ceangailte le clódóirí daite. Déantar iarracht comhtháthú a dhéanamh ar Theicneolaíocht an Eolais i ngach gné de thimpeallacht foghlama agus múineadh na scoile i gcónaí. 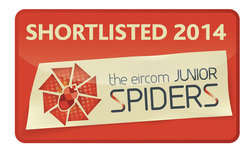 Tá blag na scoile taréis aitheantas náisiúnta a bhaint amach sna Blog Awards Ireland agus Junior Spider Awards. Tá ár dtionscdail eTwinning, a spreagann usáid na teicneolaíochta i measc scoileanna san Eoraip, taréis Quality Labels náisiúnta agus Eorpach a bhaint agam. 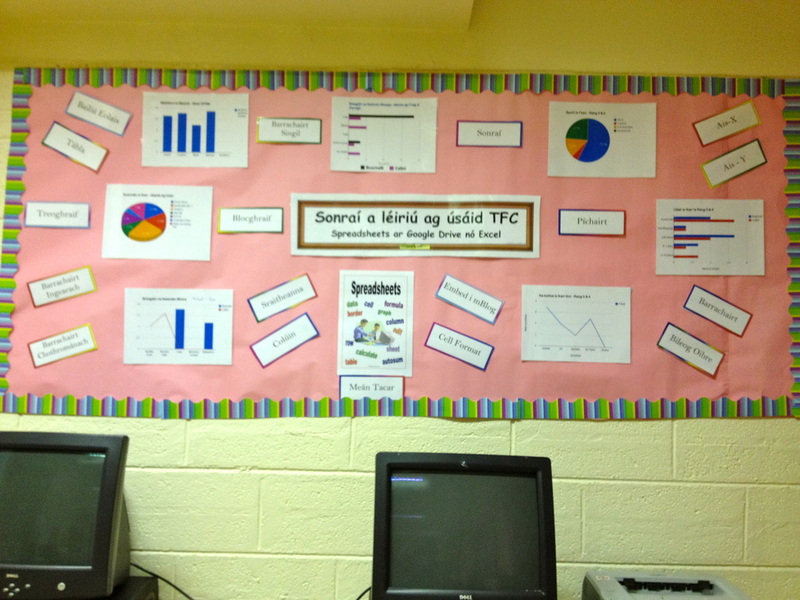 Táimid fíor-bhródúil as a bheith inár 'Scoil Digiteach' freisin mar thoradh ar ár n-obair i dTFC. 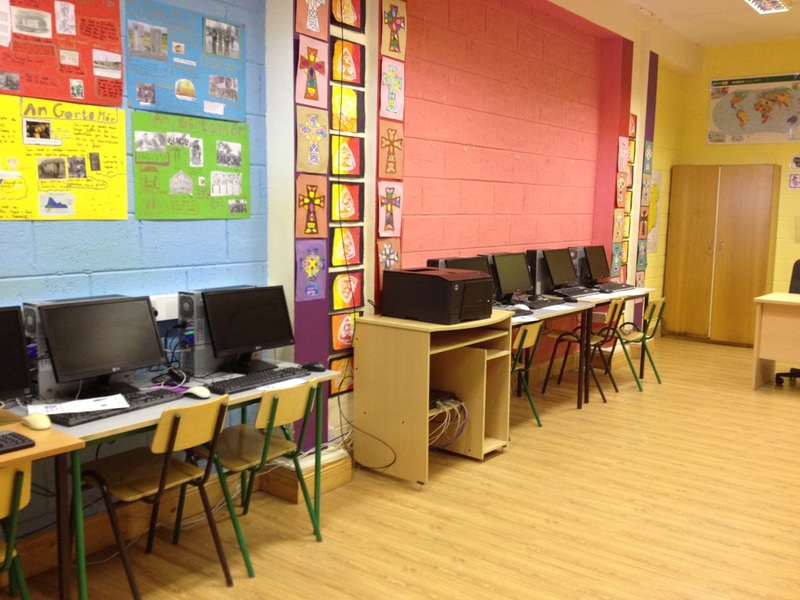 Gaelscoil Mhuscraí is committed to the development of Information Technology in the school. 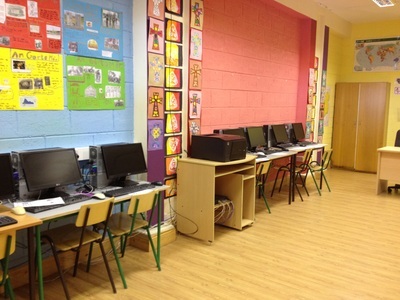 We have our own computer room equipped with 25 computers which is frequently used by the pupils to carry out research on project work and familiarize themselves with various software packages. 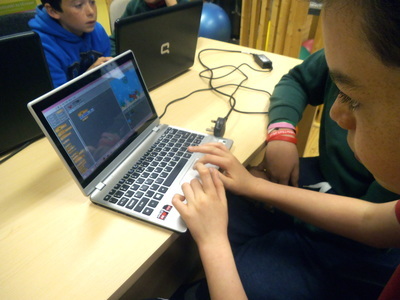 Every teacher has a laptop and has access to a flip-cam, visualiser and digital camera for use in their classrooms. 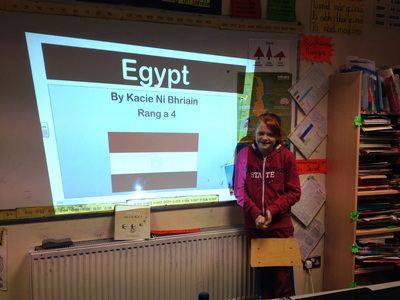 There are interactive whiteboards in six of our classrooms and the seventh classroom has the use of a digital projector. We have extensive broadband access across all the computers which are networked to numerous color printers. Every effort is made to integrate Technology and Digital Media into the teaching and learning environment. 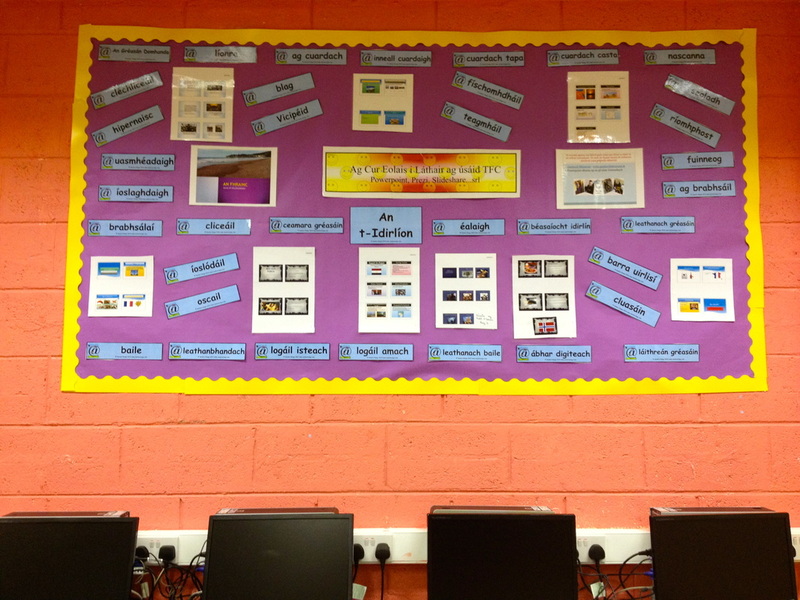 Our school blog has been nationally recognized in both the Blog Awards Ireland and Junior Spider Awards competitions. 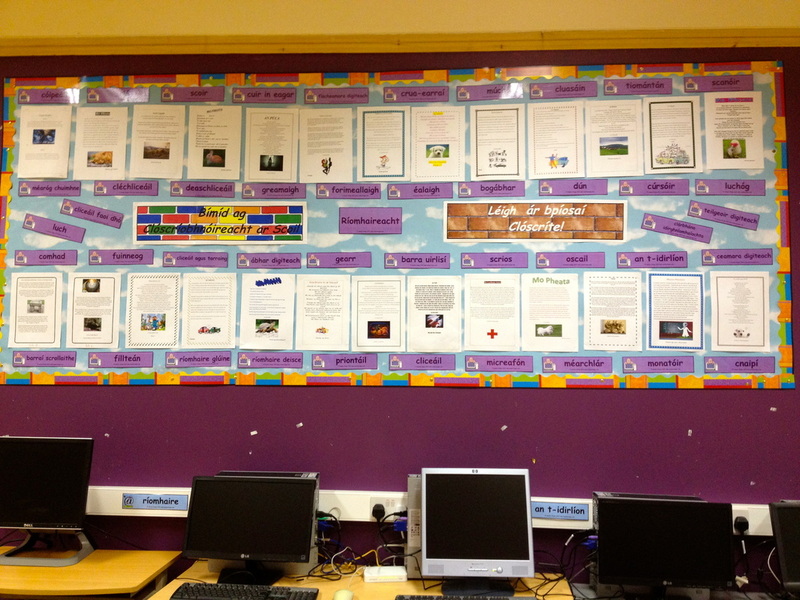 Our etwinning projects, which promote the use of ICT across schools in Europe, have won National and European Quality Labels. We are also delighted to be given the accolade of a 'Digital School of Distinction' by the Department of Education as a result of our achievements in the area of ICT. 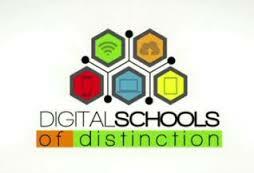 The Digital Schools of Distinction Award is a programme to promote and acknowledge best practice use of ICT to deliver the best educational experience for pupils at primary level. 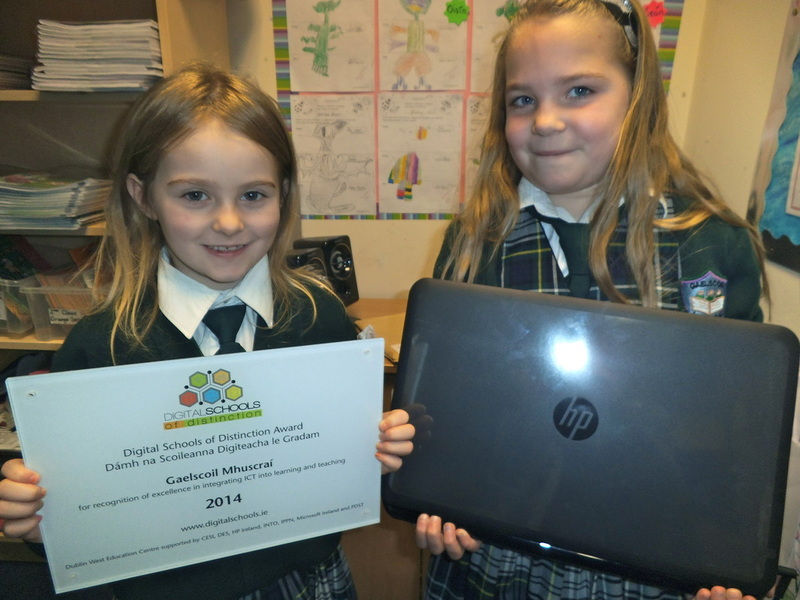 Gaelscoil Mhuscraí was awarded the status of Digital School of Distinction in summer 2014. See video below for more information about the award. 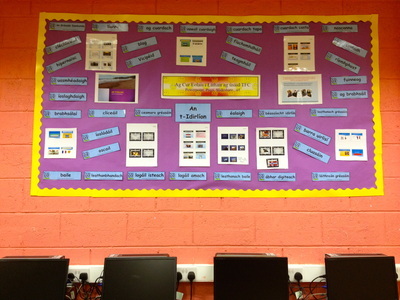 Is clár é an Digital Schools of Distinction chun aitheantas agus spreagadh a thabhairt do bhunscoileanna a bhaineann sár úsáid as an dteicneolaíocht chun an churaclam a chur i bhfeidhm dá ndaltaí. Bronnadh an gradam seo ar Ghaelscoil Mhuscraí i Samhradh na bliana 2014. Féach ar an bhfisean thíos le haghaidh a thuilleadh eolais. Bhí se de phribhléid againn a fháil amach go bhfuaireamar dhá ainmniúchan sna Gradaim Junior Spider 2014, ceann dár suíomh scoile agus ceann dár mblag. Is é seo gradam a thugtar amach do scoileanna a bhaineann sár-úsaid as an idirlíon agus an teicneolaíocht. Is mór an onóir é seo dúinn. 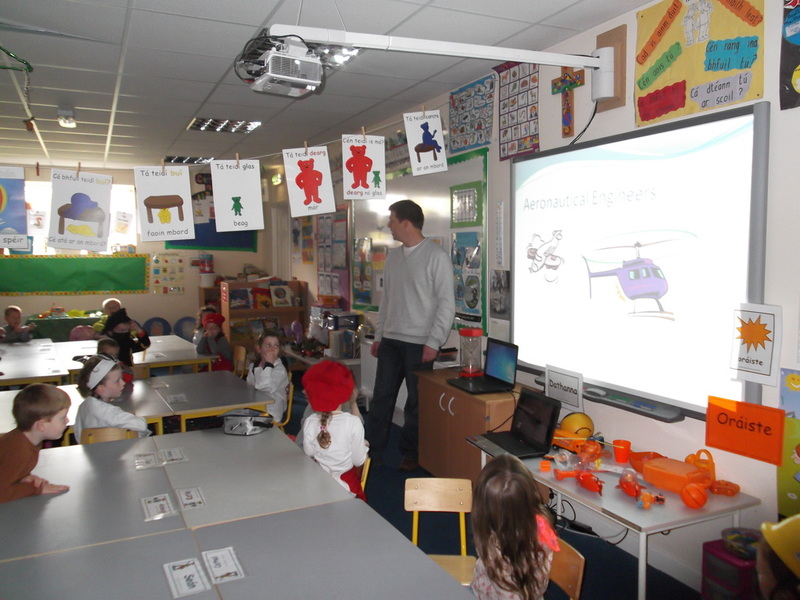 Bhíomar an t-aon scoil i gCorcaigh chun a leithéid a fháil. 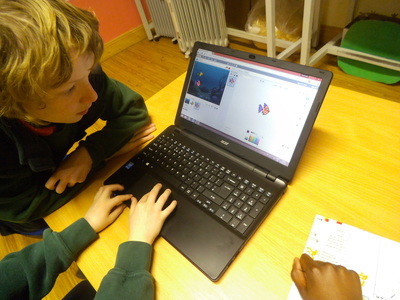 Thaisteal ceathrar scoláire le Múinteoir Mairéad chuig Google HQ i mBAC i mí Aibreán. Féach ar an bhfiseán thíos chun ár lá faoin dtor a fheiscint! We were very honoured to learn that we have received two nominations in this year's Junior Spider Awards, one in the best school website category and one in the best school blog category. 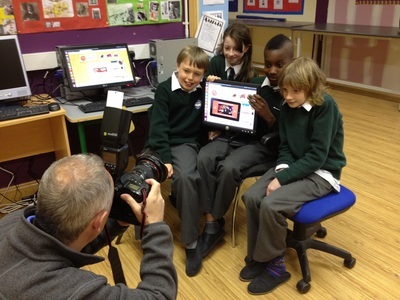 These awards recognise excellent use of the internet and IT in schools. This is a great honour for us. We were the only school in Cork to receive such nominations. 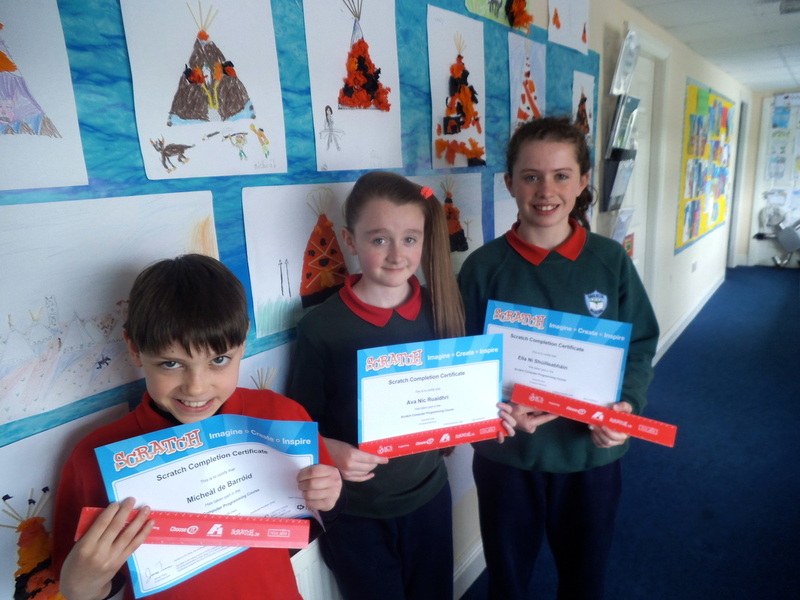 Múinteoir Mairéad and four student representatives travelled to Google HQ in Dublin for the award ceremony on April 29th. Check out the video below! 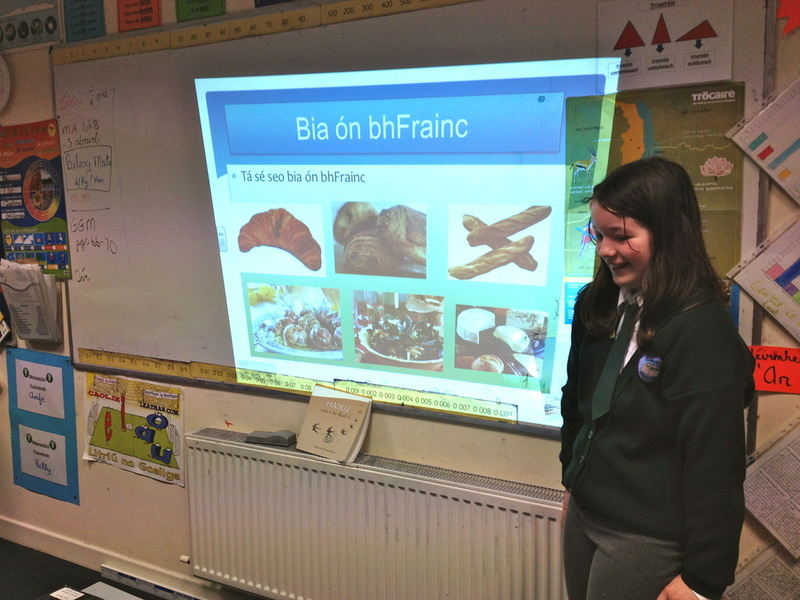 Tá roinnt ceachtanna ríomhchlárú déanta ag na hárdranganna agus fuaireadar a dteastaisí rannpháirtíochta i mí Bealtaine 2015. Táid ag obair go leanúnach ar dtionscadail 'Scratch' agus ag baint sár-taitneamh as. 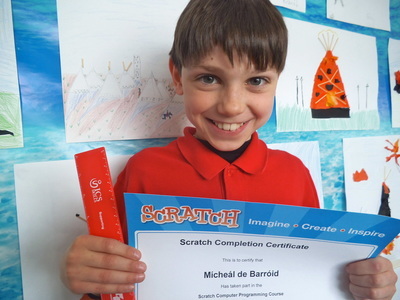 Our senior classes have completed several lessons in 'Scratch' computer programming. They received their certificates of participation from Lero (The Irish Software Engineering Research Centre) in May 2015 in recognition of their continued efforts in their 'Scratch' projects. 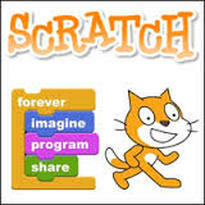 Brú anseo dár mbailiúcháin tionscadail ar Scratch. 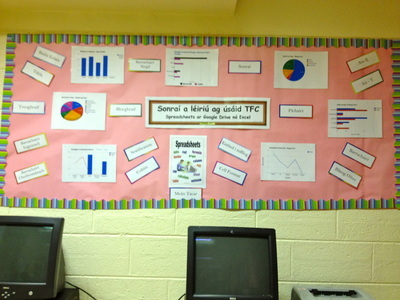 Táimíd an-bhródúil as ár suíomh scoile. Fuaireamar gradam suíomh réalta ó Scoilnet, eagraíocht an DES atá freagrach as cur chun cinn agus úsáid an idirlín san oideachas. Is gradam mór le rá é seo. Tugtar an ghradam bunaithe ar na trí ghnéithe seo; nascleanúint soiléir, obair na ndaltaí á léiriú agus an suíomh a bheith suas chun dáta.